Sold by uRead-shop (4.8 out of 5 | 8,005 ratings) and Fulfilled by Amazon. Gift-wrap available. 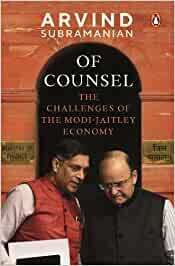 Start reading Of Counsel: The Challenges of the Modi-Jaitley Economy on your Kindle in under a minute. 5.0 out of 5 starsA well-documented, analytical & critical work! Among the nicest of minds of our time, Subramanian is a very good story-teller too! 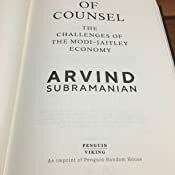 My introduction to him was mainly through the Economic Surveys which he used to edit- probably, the most engaging economic literature on contemporary India! This book, a kind of memoir, is an enjoyable read, one can feel the critical atmosphere of the political corridor, an educational journey through political-economy in action! 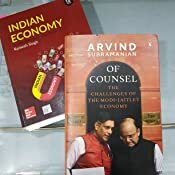 After reading the Economic Survey of India for the last two years, it is a no-brainer that Arvind Subramanian is one of the finest CEAs the country ever had. His successor will have really deep boots to fill. Coming to the book, it provides a detailed analysis of the goings-on at the Ministry of Finance, explainations with graphs and rib-tickling anecdotes that will entertain while improving your knowledge. Subramanian's thoughts on demonetisation are especially relevant. An excellent read for anyone who is interested in the goings on at North Block. Formulation of sound economic policy in India needs to meet three important prerequisites. Gandhiji said that poverty is the worst form of violence. Even after seventy years of independence, over 20 percent of our people are below the poverty line. Hence, inclusive growth and poverty eradication should be the topmost priority. Secondly, macroeconomics as a subject is a very complex science. With innumerable variables and situations that are dynamic, tons of data that is often obscure, modelling and forecasting national economic outcomes renders the job of a weatherman, child’s play in comparison. Finally, in a large democracy with scores of political parties across the country, whose ideologies span the entire spectrum of left to right and swing rapidly based on unpredictable alliances by the day, economic policy making is left to a courageous few to get it right. Policies that succeed in the West can’t be copied in India, for reasons of diversity, culture and other socio-economic considerations. Hence, the CEA needs to be apolitical and sworn to professional integrity with courage to speak the truth, diplomacy to convince the bosses and humility to maintain silence when needed. Arvind Subramanian excels in all the above criteria in his role as CEA. The quantum and quality of work in making policies that are sound in theory, supported by political bosses and successful in implementation, is outstanding. There is a brief and brilliant introduction that presciently covers the key points and nudges one to read further. Each chapter is devoted to an important topic. The views in many chapters are contrary to what the Government has done, but then the office of the CEA is advisory in nature. Political compulsions can override sound economic advice, at least in the short run. His views on demonetization of November 2016 is one such example. He discusses the twin puzzle of political victory in the UP elections, despite the hardships faced by the people, and the economic puzzle of a mere 2 percent blip in the GDP despite 86 percent of the cash being sucked out overnight from the monetary system. There is a powerful argument to abolish subsidies in agriculture. He discusses two types of agriculture in India. The cereal centric farming is smothered in love benefiting cereal and big farmers while pulses, diary, livestock, oil seeds and vegetables are loved too little in the current policy framework. Minimum Support Price and other subsidies of fertiliser and power to rice farmers is egregious. It is unfair to poorer farmers who cultivate non irrigated crops, impacts depleting water table, worsens soil quality and adds to the already accumulating ‘Kumbakarna-esque’ rice mountains that is left rotting to the rats. 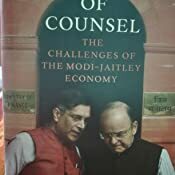 The chapter on Twin Balance Sheet challenge that is plaguing the Banking System with Non-Performing Assets and the core industries like power and steel being bankrupt due to idle assets makes excellent reading. This would perhaps be the most important hurdle to get our way across to kick start the economy. We need to exorcise the ghost of crony capitalism and its new avatar stigmatised capitalism through transparent and clean governance. Focus on 5 R’s – Recognition, Reconciliation, Recapitalization, Reform and Regulation to put Banking back on track. If there needs to be a serious consideration by the Nobel Committee in awarding a prize in Economics that matters positively to the well being of over a billion people, it should perhaps be awarded to GST in India. Though it is still work in progress in terms of fine tuning of rates and simplification of processes. Arvind Subramanian would surely find his name in the citation. The book clearly brings out the fact that we need to re-examine our model of ‘Precocious Development’ that has put the proverbial cart before the horse by encouraging services at the neglect of agriculture and industry. Arvind says that a good CEA should be both Karna and Arjuna. In fact, he needs the unconditional support and choicest blessings of all the three mighty Lords, Vishnu, Shiva and Brahma to re-examine and realign our policies. We need Vishnu to excel in programs like GST, Make in India and JAM. We need Shiva to gather courage to eliminate outdated schemes that drain revenues and nurture illegal leakages. We need Brahma to fully leverage our creative minds to introduce innovative ideas like QUBI. Together we can banish poverty, usher in prosperity and regain the rightful place under the sun for our great nation. Mahatma Gandhi would certainly bless Arvind for his outstanding work and this book. For a common man like me, it is a huge debt of gratitude to Arvind and Team CEA, that I would never be able to repay. Fortunately, some debts don’t add to our NPAs and need no waivers by politicians. Thank you, Professor. JAI HIND. 5.0 out of 5 starsEconomics too can be a graitified read !! An exhilarating apt read,which duly justifies its title. Dr subramanian segues from obstcales of indian economy with command satire and rejoinderd Solutions for the same !! 5.0 out of 5 starsAdroit. Articulate. Honest. Highly engaging. If one wants to know the immediate past history behind India's current state of economics this book is the best there is. A fantastic account of India's growth through the eyes of the engine behind it. Arvind Subramanian details the inextricable equation of the economic lineage and pressing factors to be addressed and worked on for guaranteed results. 5.0 out of 5 starsIn your small room,at the corner of which is a book shelve,this volume is a must to add to it. For all those who aspire to rise high and add thoughtful insights to ones fresh ideas,this volume is a must go through.Especially for all those who find policy issues farther more interesting than anythn els.And evrytime that i find myslf so happy its more often cz i find amazon delivery at my door step figuring out since years that they have been doing their best for the customers. Expected more sensational and juicy info but the author has disappointed me, the reader. His views are more or less neutral... I was expecting more on DeMon related `inside' info but nothing that sort of found in the book... Since he was the CEA, the expectation was high but the expectations were not met..
5.0 out of 5 starsAuthoritative, thought provoking and lot of food for thought. Definitive reading for those interested in India's economic policy. 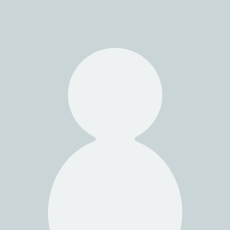 It delves deep into some of the political hot potatoes like RBI's excess reserve, power sector mess, agricultural issues with authoritative arguments and recommendation. On GST he has given a peak into the decision making process and revels at India's cooperative federalism.